This wooden dining table is very stylish even though it is just a simple design. With its distressed finish it would be recognised within your dining room. Curved bentwood frame with cross back in a distressed black stain adding a touch of style to this on trend dining chair. Price is for two chairs. The Saltash Collection Large Bench is characterful, stylish and made from reclaimed materials. With its on-trend distressed natural finish, this dining bench would perfectly adapt itself into any modern dining space as well as seamlessly blend into a country styled home. Versatile and gorgeous, the Saltash collection will transform your home. Marry the Dining Chairs with the Saltash Extending Dining Table for a classic family Dining set. This Time Worn Small Sideboard is characterful, stylish and made from reclaimed materials. With a driftwood timber top contrasting against its on-trend distressed white/off white painted base, this piece would perfectly adapt itself into any modern living space as well as seamlessly blend into a country styled home. Versatile and gorgeous, the Purbeck collection will transform your home. With 2 drawers and 2 doors, this piece has sufficient space for all your storage needs. Combine the Purbeck Sideboard with the Purbeck Top Unit for a uniquely stylish Dresser. A sturdy solid oak dining chair, with curved ergonomic support. Created by craftsmen to offer the height of quality. Natural lacquer finish. Featuring an linen upholstered seat and decorative turned front legs. The Boston reclaimed wood dining table is a superb feature table. Made from reclaimed elm with an aged rustic look, the table is both solid and impressive. Standing on turned legs with connecting frame with a plank effect style table top. This table is also available in a larger size and also round and oval. This Two Tone Dining Table extension leaf slots neatly into the end of the Purbeck Two Tone Dining Table and clips into place to provide an extended table. Can be used on either end of the table. The Boston reclaimed wood large dining table is a superb feature table. Made from reclaimed elm with an aged rustic look, the table is both solid and impressive. Standing on four turned legs with connecting frame with a plank effect style table top. This table is also available in a smaller size and also round and oval. This set includes the Dining Table 150cm x 90cm which extends to 200cm and 6 x Rattan Dining Chairs. This Two Tone Small 160cm Dining Table is characterful, stylish and made from reclaimed materials. 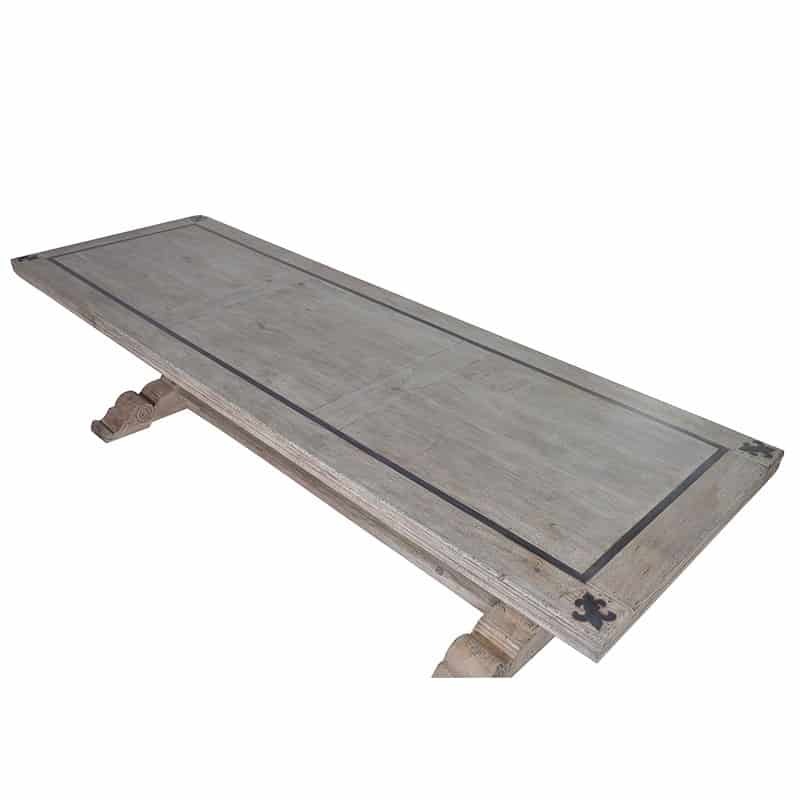 With its on-trend distressed white/off white painted finish, this table would perfectly adapt itself into any modern dining space as well as seamlessly blend into a country styled home. Versatile and gorgeous, the Purbeck collection will transform your home. Marry the Purbeck Dining Table with the Purbeck Dining Chairs or Bench for a classic family Dining set. The beautiful Idaho reclaimed dining set brings both elegance and style to your dining area. A striking clean and modern dining collection reminiscent of Scandinavian simplicity. Available in both a dark wood and natural wood finish, this dining table set blends perfectly with the Alpha chair for any dining solution. This set includes the Dining Table 240cm x 100cm, 6 x Dining Chairs as per the image.